We love the tradition of a layette, a little bundle of necessities to prepare a newborn for its first few months. And even more, we love the idea of sewing it ourselves! 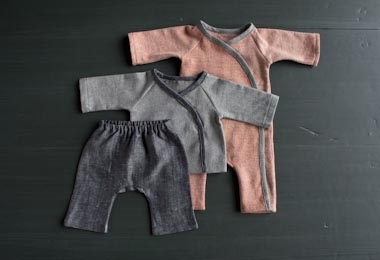 Purl Soho's Sewn Layette Pattern is ripe for mixing and matching, so whether you’re making one special piece or one of everything, baby is sure to look super sweet. Sized from newborn to 6 months, choose to receive your Pattern as a PDF download or a hard copy. For more information, including a list of materials you'll need to make your Sewn Layette, please click Product Details, above. 1/2 to 1 yard of light or midweight fabric for each garment. We've made versions in Moda's Muslin 200 Count, 45-inch, Robert Kaufman's Shetland Flannel, and Robert Kaufman's Rustica Chambray. A 110-yard spool of Gutermann's Cotton Sewing Thread in a color to match the fabric. A 110-yard spool of Gutermann's Cotton Sewing Thread in a color to match the bias tape. 12 inches of thin ribbon for each garment. We used Studio Carta's Fettucia Ribbon, 1/4 inch in Natural. To fit a baby whose weight is 11 (14, 17) pounds and whose length is 22 (24, 26) inches.